As with every other repair-based profession, there are some things plumbers cannot do without. Here are ten of the tools that every plumber should have. The common cup plunger is a tool that every plumber should have. It should be a staple in any home as well, as the design of this plunger works with most common sinks and toilets in removing small clogs in pipes. A superior plunger specifically designed for toilets, the flanges at its end and dome shape allow for the creation of a vacuum that works to remove heavier clogs than a common plunger could. To prevent leaks while repairing or replacing joints or segments of pipe, this tape made by Teflon is the closest thing to applying sealant with the benefit of saving time and flexibility of the material. Like plungers, this is something most plumbers would recommend to homeowners to keep handy in case of emergencies. For clogs in sinks too far to be moved by a plunger, the sink auger uses flexible cable that can pull out or destroy obstructions within a pipe and clear the way for water to flow. Designed specifically for use with toilets and older water closets, this auger is of a different design and strength than the sink auger. For purposes of sanitation and to prevent damage to pipes, augers should be used for the kinds of pipes they were designed for. Preferably an adjustable design, the pipe wrench is the main tool in a plumber's arsenal. With proper strength and grip, one can tighten or loosen most pipes with little fear that washers will be damaged in the process. Depending on the style of the pipe wrench, evidence of teeth may be present, but the adjusting properties are hardly ever compromised. There are several different faucet types that vary based on water compression and flow, but the faucet valve seat wrench allows for the removal and replacement of faucets. 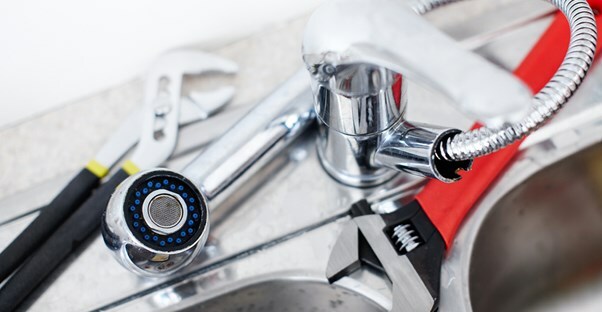 Usually when leaks emerge from the base of the faucet, it is a sign that the faucet valve seat has been worn down and is in need of replacement. Unlike the faucet valve seat wrench, a reseating tool works for compression faucets. When resurfacing a valve seat rather than replacing a faucet completely, this is the tool to reach for. It does, however, require a bit of finesse and experience to handle correctly as the wrong application of pressure can wear down the valve seat and ruin the body of the faucet entirely. In that event, replacement becomes necessary. Seals and washers around certain faucet stems are made of rubber, nylon, or some silicone composites in newer faucets. Older models use wax or graphite. With faucet packing, you can apply replacements for worn or broken seals. Some stripping may be necessary for an exact fit. For smooth, leveled cuts in copper pipes, a tube cutter is essential. With a connection of clamps, you can securely latch on to a pipe and slowly work around until the proper cut is made.